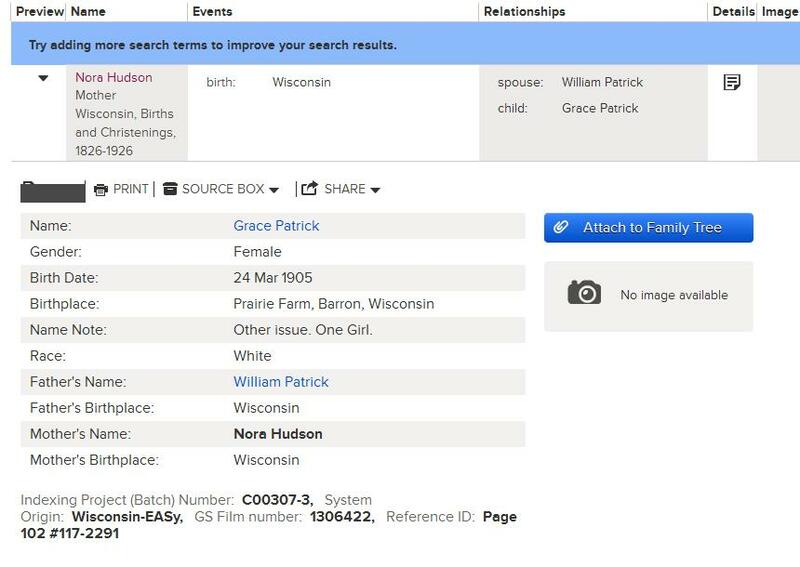 Nora Marie Hudson was born on 1 June 1885, in Brodhead, Green County, Wisconsin. On 9 Aug 1899 she was married to Wm. Patrick in Rock County, Wisconsin. She had barely turned 14 when she married. In 1900 she and her new husband lived in Avon, Rock County, Wisconsin with her father and mother. By the 1905 Wisconsin census the family had moved to Prairie Farm, Barron County, Wisconsin. She has two daughters, Gladys born in 1902, and Grace born 24 Mar 1905, my first cousins 2x removed. This second item was also found at Family Search with the same Name Note. It refers to the same film number. 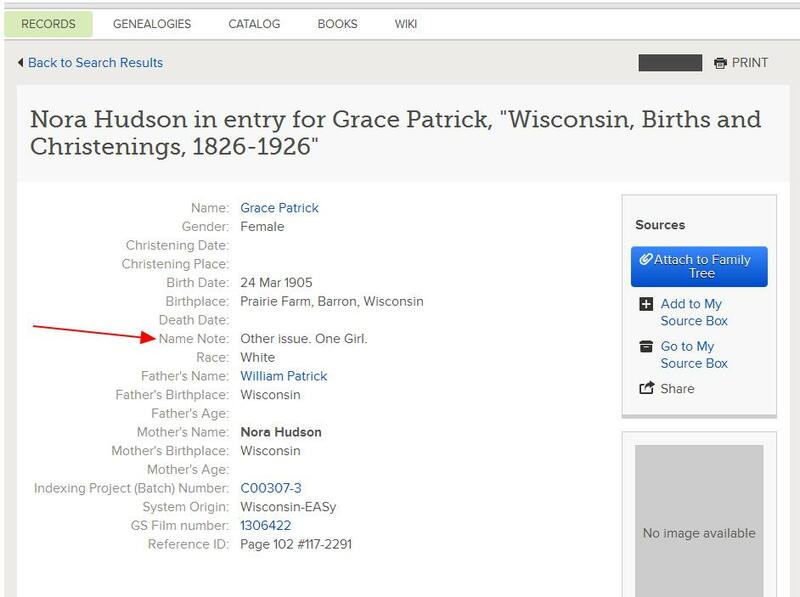 In checking with the Wisconsin Historical Society’s website, Grace’s birth comes up in a search, but provides even less information. However this did provide a learning experience for me. 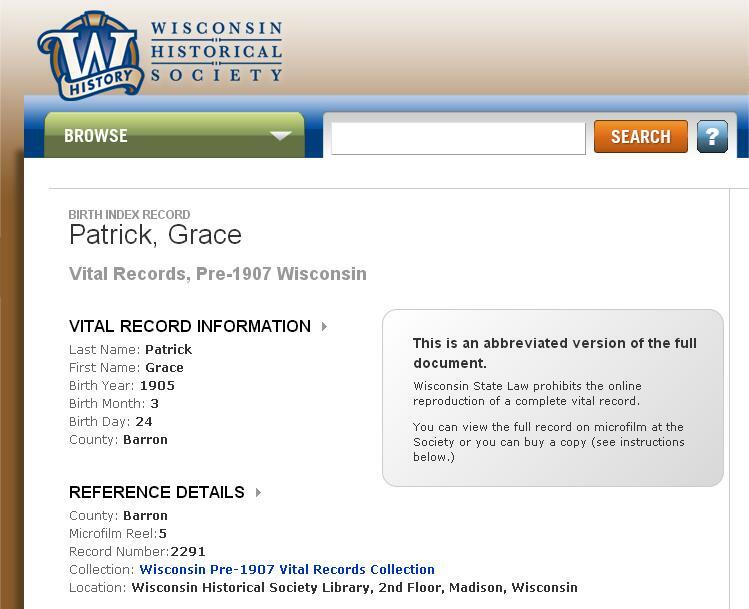 I didn’t realize Wisconsin prohibited online reproduction of complete vital records. Apparently ordering the microfilm is my next option. Can anyone tell me what other issue refers to? I haven’t seen this before, so am unclear what it means. Is it referring to Gladys’ previous birth, or possibly another girl born the same day? Other issue is acknowledging that there is another child born before Grace. It is referring to Gladys. First time I have ever seen that on a birth record before.